Both jaguars and leopards have spotted coats, but the jaguar has fewer and larger rosettes (spots), often containing small dots. Jaguars are shorter and stockier than leopards. Most jaguars have golden to reddish-brown spotted coats with white bellies. However, melanistic jaguars or black panthers occur about 6% of the time in South American cats. Albino jaguars or white panthers also occur, but they are rare. Male and female jaguars have a similar appearance, but females tend to be 10-20 percent smaller than males. Otherwise, the size of the cats varies greatly, ranging from 3.7-6.1 feet from the nose to the base of the tail. The cat's tail is the shortest of the big cats, ranging from 18-36 inches in length. Mature adults may weigh anywhere from 79-348 pounds. Jaguars in the southern end of their range are larger than those found further north. The jaguar's range once ran from the Grand Canyon or possibly Colorado in the United States down through Argentina. However, the cat was heavily hunted for its beautiful fur. While it's possible a few of the cats remain in Texas, Arizona, and New Mexico, sizable populations only exist from Mexico through Central America and into South America. The cat is protected and believed to have a high chance of survival in the Ka'an Biosphere Reserve in Mexico, the Cockscomb Basin Wildlife Sanctuary in Belize, the Manu National Park in Peru, and the Xingu National Park in Brazil. Jaguars are disappearing from most of the remainder of their range. While jaguars prefer forested areas near water, they also live in shrubland, wetlands, grasslands, and savanna biomes. While jaguars resemble leopards, their ecological niche is most similar to that of the tiger. Jaguars stalk and ambush prey, often falling upon the target from a tree. They are strong swimmers and readily pursue prey in water. Jaguars are crepuscular, usually hunting before dawn and after dusk. Prey includes capybara, deer, pigs, frogs, fish, and snakes, including anacondas. The cat's jaws have a powerful bite force that enables them to crack open turtle shells and defeat all but the largest caimans. After making a kill, a jaguar will haul its dinner up a tree to eat. 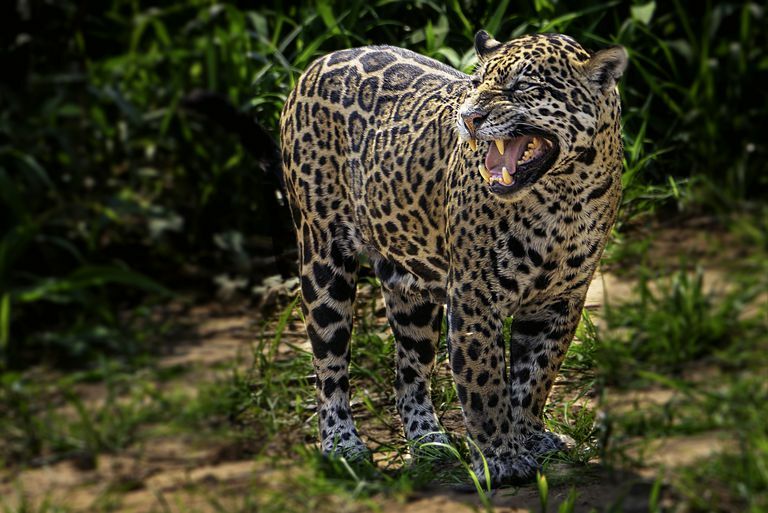 Although they are obligate carnivores, jaguars have been observed eating Banisteriopsis caapi (ayahuasca), a plant containing the psychelic compound N,N-Dimethyltryptamine (DMT). Jaguars are solitary cats except for mating. They mate throughout the year, usually whenever food is abundant. Pairs separate immediately after mating. Gestation lasts 93-105 days, resulting in up to four, but usually two, spotted cubs. Only the mother cares for the cubs. Cubs open their eyes at two weeks and are weaned by three months of age. They stay with their mother for a year or two before leaving to find their own territory. Males typically have larger territories than females. Male territories do not overlap. Multiple females may occupy a territory, but the cats tend to avoid each other. Females reach sexual maturity around two years of age, while males mature later at age three or four. Wild jaguars live 12-15 years, but captive cats may live 23 years. The IUCN classifies the jaguar's conservation status as "near threatened." As of 2017, the total cat population was estimated to be around 64,000 individuals and was decreasing rapidly. Jaguars, especially males, range across vast territories, so the animals are heavily influenced by habitat loss and fragmentation from development, transportation, agriculture, pollution, and logging. As apex predators, they are at risk from diminishing availability of natural prey. Jaguars are not protected across much of their range, particularly in countries where they threaten livestock. They may be hunted as pests, as trophies, or for their fur. 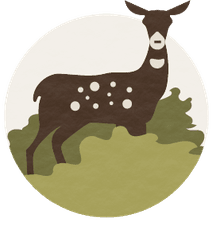 While the Convention on International Trade in Endangered Species of 1973 greatly reduced pelt trade, illegal trade remains a problem. Unlike leopards, lions, and tigers, jaguars rarely attack humans. However, the combination of human encroachment and decreased prey has led to increasing conflict. While the risk of an attack is real, jaguars and pumas (Puma concolor) are much less likely to attack people than other big cats. Perhaps a handful of human attacks by jaguars have been documented in recent history. In contrast, over a thousand people have been attacked by lions in the past 20 years. While the direct risk to humans is small, jaguars readily target pets and livestock. Dinets, V. and P. J. Polechla. "First documentation of melanism in the jaguar (Panthera onca) from northern Mexico". Cat News. 42: 18, 2005. Wozencraft, W.C. "Order Carnivora". In Wilson, D.E. ; Reeder, D.M. Mammal Species of the World: A Taxonomic and Geographic Reference (3rd ed.). Johns Hopkins University Press. pp. 546–547, 2005. ISBN 978-0-8018-8221-0.